Land Rover’s Defender is the stuff of legend. With a design that’s barely budged from the boxy shape of the utilitarian and mechanically bulletproof “Land Rover” unveiled in 1948, the Defender, just like its Germanic rival, the G-Glass, has a reputation for being one of the most capable vehicles off the road. Unfortunately, the off-roading icon was phased out at the start of 2016 due to safety and emissions regulations—after more than three decades of continuous prodcution. The good news is that a successor is coming in 2020, and a prototype has just been spotted. Redesigning an icon is no easy task, and Land Rover has no intention of taking the easy route of simply updating the original design to meet the latest regulations, like what Mercedes-Benz did with its redesigned G-Class. It appears Land Rover is increasing the size of the Defender as well as maintaining some of the proportions of the original while also toughening up the stance. 2021 Land Rover Defender spy video from Motor Authority on Vimeo. Finer details like the contours of the hood and roof as well as the design of the rear canopy are all hidden under thick camouflage gear. We can see that the overhangs are extremely short, especially at the front. 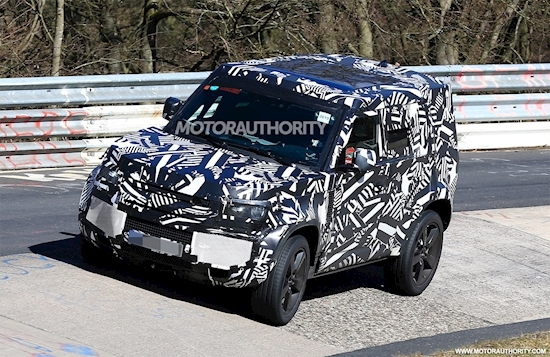 The prototype is for a long-wheelbase, 5-door Defender but a short-wheelbase, 3-door model is also in the works. Various other body styles are planned including a pickup. The short-wheelbase model could end up as a Defender Sport. We've also heard that plug-in hybrid and full electric Defenders are planned. The redesigned Defender was originally due in 2015 but frequent design changes led to delays. The DC100 line of concept vehicles from 2011 was meant to hint at a new, inexpensive Defender designed to target Toyota’s Hilux workhorse. Those plans apparently didn’t sit well with Defender devotees and so it was back to the drawing board for the design team. The vehicle is now confirmed for a market launch in 2020, meaning we'll likely see it arrive as a 2021 model. Under the revised plan, the Defender will be positioned as a premium offering not unlike the G-Class. This has led to the decision to base the SUV on a new platform known as the Modular Longitudinal Architecture (MLA), which will be shared with next-generation versions of the Range Rover, Range Rover Sport and Discovery. This means fully independent suspension front and rear, with the new rear design in clear view in the spy shots. A low-range transfer case and multiple differential locks should still be present for superior performance when going off-road. Powertrains should include a 2.0-liter turbocharged inline-4 as the base option and the same engine working with an electric motor in plug-in hybrid guise. Such a setup features in plug-in hybrid versions of the Range Rover and Range Rover Sport, where it delivers 398 horsepower and 472 pound-feet of torque. A turbocharged 6-cylinder is also likely, and as mentioned earlier an electric option is expected. Land Rover will reveal the new Defender later in 2019. As for pricing, Land Rover is likely to position the new Defender somewhere between the $53,085 Discovery and $67,745 Range Rover Sport. The good news is that the positioning will likely be closer to the Discovery, as Land Rover is well aware that many Defender faithful use the vehicles as a workhorse.